Just throwing this out there. I have noticed a lot of guys are going for the higher compression builds ..... I'm curious as to the real advantages to this over just turning the boost up? I have noticed a lot of guys are going for the higher compression builds ..... I'm curious as to the real advantages to this over just turning the boost up? What are those replying considering high compression? What is low? I've heard of 7.8:1 compression rebuilds and ive seen a TR class car with 10:1 that spooled an old cast 76 like it was 15mm smaller. I wont ever go less that 9:1 on builds. Im at 10.25:1. I built the engine for 9.5 with a .060 gasket to allow the use of different heads. I ended up going with a .027.
high compression improves volumetric efficiency and reduces the amount of residual gas leftover in the chamber after the exhaust stroke. Higher compression equals greater efficiency which,among other things,equals better mileage,smoother idle,and better throttle response. The turbo will spool faster and more torque will be produced,especially at the lower rpm range. These qualities of higher compression are especially beneficial to the street car enthusiast who despises good traction. In my case,I went from 7.88 to 9.29. I was initially shooting for 9.0 and chose piston specs based on the 46 cc advertised combustion chamber volume of the TA SI cylinder heads. They ended up being 48.8 cc and,after I un shrouded the intake valves because I could because of my 4" bore,the combustion chamber volume ended up at 50.2 cc. I ended up using a .027" head gasket instead of the .060" gasket that I initially wanted to use,which produce better port alignment. This got me to 9.29 to 1 compression ratio. As foolish as I am and because of the benefits I've received from the increased compression ratio,I wouldn't be surprised if I order some new pistons to get the compression ratio up to 10 to 1. I do also use E85. It's also a great way to patch up an engine that's a dog from too much cam. There's literally almost no downside to high(er) compression. High 7's and low 10's was the CR range I was thinking of when asking for opinions on the subject. My current build will probably be in the 8.0 range due to changes made in the chamber shape and a block modification. The changes were made in an attempt to go in a slightly different direction than the typical build. Have heard that the quicker spool is a nice bonus of the higher compression motors and some of the other positives that you guys are posting are definitely reasons to consider higher compression. Since my motor is going to be on the lower CR side.... hopefully running a lot of boost in conjunction with the extensive port work that I've done to the heads will make up for any short comings of the lower CR. There's no such thing as "will make up for". Once you lost ground going to lower compression there is nothing you can do to get it back. More boost means more back pressure and will hit a wall with VE sooner than a higher compression engine would. I understand that one combo may be more efficient than another. It may take 35 PSI for my motor to make 750 HP where as another higher compression motor may make the same HP at a much lower boost level. Isn't Richie Balcom's engine compression like 8:5:1? You shouldn't be using only manifold pressure as your reference point for how efficient an engine is. I will say that engines that make the power at lower manifold pressures with no other changes will typically go noticeably faster because the turbo has less work to do to move the air. You may go backward in power trying to make 35psi. Exhaust pressure in the 80's and cylinder fill in the crapper. When the exhaust pressure vs manifold pressure starts getting ugly the power (VE) falls off a cliff. So to get that engine more efficient only mechanical aspects of it can improve it. You're al out of manifold pressures positive effect to fill the cylinder. So raise the CR, reduce valve overlap, taller gearing, converter very specific, or leave everything the way it was and go with more turbo, specifically the hot side since it seems to be the biggest bottleneck on most engines. If I were to go all in on the turbo I have little doubt that on the 9.45:1 engine it would make much more than my 8.3:1 and it would run the turbo out at lower manifold pressures. Here's a 9.45:1 Iron head engine. Looks like about 1 sec to 15psi. Half throttle foot brake MFS 6766 .85 a/r. His engine makes the same power as the 8.3:1 aluminum headed (higher flowing potential for sure) stock short block engine in the blue car at approximately about 7 psi less manifold pressure. Same turbo on both engines. Cam overlap within 2 degrees of each other at .050". It's not just a little gain in efficiency. It's huge in this example. Here's a couple quick hits from above mentioned engines. Both of these hits are peak of approximately 640whp give or take a few and mine falls off at 5800. His was still cranking it out to 6000-6100 where I stopped the highest rpm hits. They are both same port injected 93/alky with SSI 3.5 bar MAP sensors, same turbo, his is iron heads, mine has ported aluminum similar converters (his 16 blade 9.5" and mine 17 blade 9.5"), very similar cams, etc. 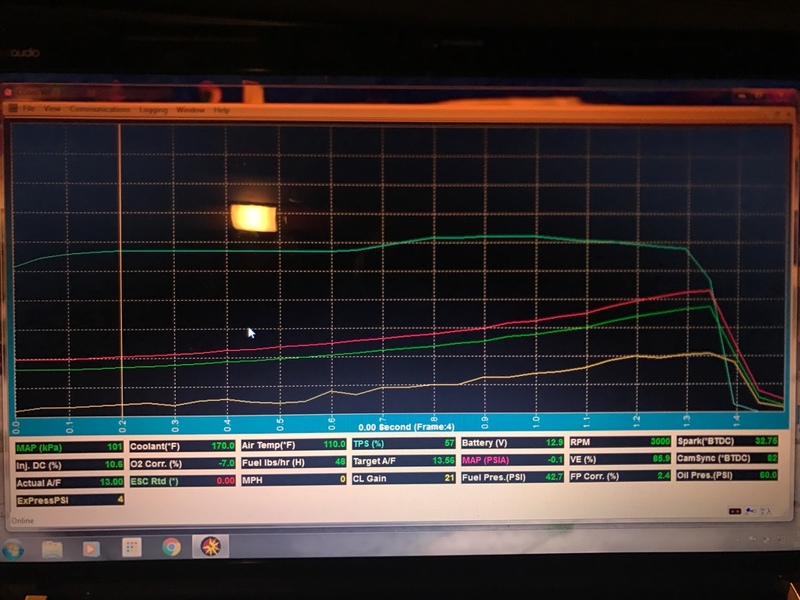 Notice his manifold pressure is 6+psi less than mine even though I have better heads, and honestly a lot more refinement in the tune on mine since I've had it for several years. His at the point of this log had only had about 25 seconds of WOT time on it at the end of this hit and I was adding manifold pressure every hit. As you can see the VE % is a little higher on mine but I was also targeting a richer a/f's and they play into the displayed VE a little and 6-7psi higher manifold pressure because of the alky injection. His engine is also much better with bsfc. Meaning it takes less fuel to make the same hp. The turbo wasn't close to all in on either. 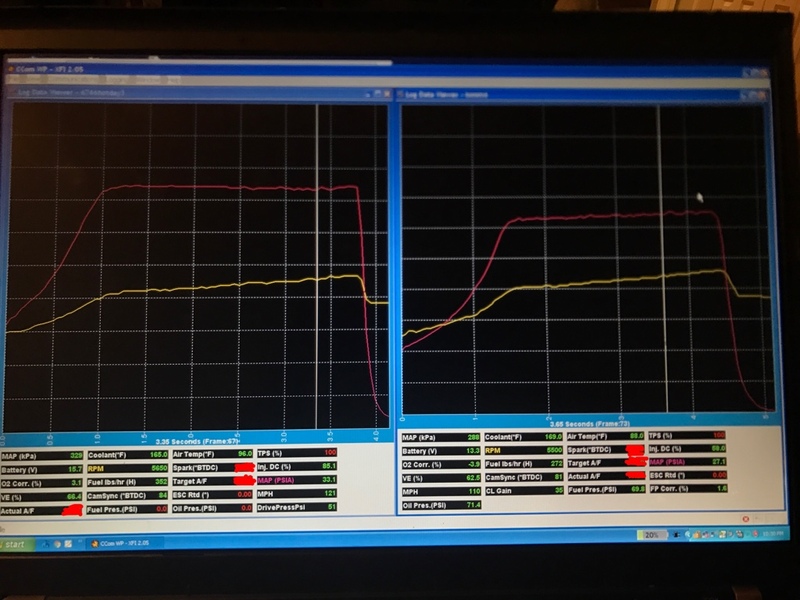 Imagine both tuned on good fuel and his engine at 33+psi manifold pressure? It would be 720+whp still on conservative timing and a/f numbers. I was a lot closer to all in than he was and he still has the same power as I do. The effects of raising the CR are drastic in this example. Of course the tuning window is more narrow but 9:1 isn't outrageous at all even with 93/alky. Dont fear the boost, don't fear the CR, watch out for the timing! Excellent work and education, Bison!!! Really gives you insight on how combos really work with real world results, not just text book bs. Love it!!!! It may take 35 PSI for my motor to make 750 HP where as another higher compression motor may make the same HP at a much lower boost level. that's if you can make that kind of boost.on a good motor it can be real hard to make big boost the turbo has to have enough nut. Work (Trq) is achieved through pressure (force) and leverage (stroke). The key is to control pressures and associated heat energy of combustion. HP is a calculated number of RPM and Trq. Great thread. There is another GREAT thread somewhere about 8 years old now called "boost vs back pressure". Should be a sticky imo.